St. Petersburg museum comes 6th out of 25 on list of world art treasures. 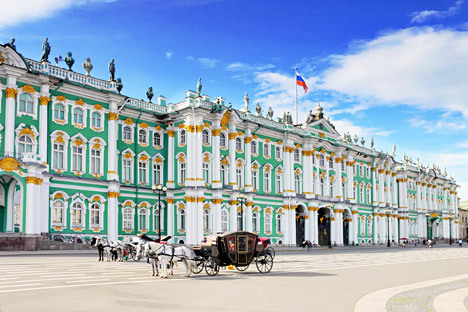 The TripAdvisor travel website has ranked St. Petersburg’s State Hermitage Museum 6th out of 25 world art treasures. It is not the first time that the museum has obtained a leading position in the world rankings. Last year TripAdvisor hailed it as the best museum in Europe. This year it is included in the list of 25 "best of the best" museums in the world in its Travelers' Choice awards. The Hermitage was surpassed by the Metropolitan Museum of Art in New York, ranked the best in the world, the Musée d'Orsay in Paris, the Art Institute of Chicago, the Prado in Madrid and the Louvre. “All of the world's beauty in one museum. It lets your mind travel to all the places and eras you always wanted to go,” reads the description of the Hermitage on the TripAdvisor website. RBTH asked Russian Presidential Special Representative on International Cultural Cooperation and former Culture Minister Mikhail Shvydkoi to comment on the Hermitage's success. He said: "It is just that the Hermitage is found in the Top 10 of this list. The Hermitage is Russia's largest and most famous museum. In its life it has had various periods but the last quarter of a century, under Mikhail Piotovsky's leadership, the Hermitage has been lucky." “According to film director Alexander Sokurov, who dedicated his new film Francophonia to museums, ‘the Hermitage is the Louvre's younger brother.’ Indeed there are many wonderful museums in Europe, but today it is necessary to value not only their collections but also the activities they conduct,” said Shvydkoi. “The museum of the 21st century is completely different from the museum of the 19th century, it is a center of development. In this sense the Hermitage is of extreme importance," he said. Among other major Russian museums Shvydkoy named the Russian Museum and the museums in the suburbs of St. Petersburg, as well as Moscow’s Tretyakov Gallery and State Pushkin Museum, none of which were included in the rating this year. However, ratings vary and are based on various categories, which is why they should be viewed with certain reservations, he said.